I need to gather my thoughts -- much has been seen, much has been said! On our way back from California the air conditioner in my car failed in the middle of Nevada desert. I feel baked, as if I've spent three days on the hot beach. I had a long, five-hour talk with Jack on the previous day, in his house. I will describe my impressions and Jack's opinions in a series of small topical reports here. I think it would be better than posting one long detailed report. I am open to any questions, and will answer them to the best of my ability. Regarding religion, I can confirm that Jack Vance strongly disapproves of it. He said: "We've got one life, and that's it! ", slammed the table with his heavy palm, and even fractured the stem of his glass of Scotch, to make a decisive, emotional point. He thinks that religion stems from primeval ignorance and fear, and asked me if I agree with the notion that Christianity created and promoted anti-Semitism. Of course I agree. Muslim anti-Semitism is a relatively new phenomenon -- Islam has been tolerant to Jews in the times of its cultural peak. European Christian Church, on the other hand, has been persecuting Jews from the beginning, and always endorsed indoctrinating children with the notion that "Jews crucified Christ". One cannot easily forget being beaten by the six good Christians for being half-Jewish. I've brought with me a bottle of 15-years-old Laphroaig. Jack Vance was visibly pleased -- he likes that stuff. Glasses for whisky were put on the table by somebody from John's family. These were thick-walled carved-crystal glasses on inch-long stems. I am not much of a whisky drinker but, as far as I know, short, flat-bottom glasses are usually served when it comes to whisky. Jack probably thought so, too, and forgot that his glass had a stem. After slamming the table with his palm while fustigating religion, Jack Vance took a glass, made an emphatic wide gesture, and struck the old piano with the foot of the glass, thereby breaking the stem and spilling the whisky. Norma was, perhaps, afraid that he could cut himself, and immediately chastised him for it; Jack was somewhat irritated by her paying too much attention to this trifle. I put another glass into his hand, and Jack forgot about this incident. Actually, I made a fool of myself by bringing also a bottle of a sweet 1940 Crimean Massandra Muscat. Jack Vance doesn't like sweet wine, and didn't hesitate to tell me so. Alas, my precious bottle from Stalin's cellars remained there on the table, almost full and forgotten! But it started Jack on a long speech about Russia. Jack Vance told me that he's been always terrified by the dark proclivity of Russian governments toward torture and murder. Jack has been reading Chekhov's book about hard labor for exiles on Sakhalin Island, and Solzhenitsyn's Gulag Archipelago. He was unusually emotional about Peter the Great's sadistic tendencies, telling me several times that he couldn't imagine how a father could make a trap for his own son, and then torture him for hours. Somehow, he was preoccupied for a while with that "father torturing his son" theme. I had a definite feeling that he wanted me to argue on Peter's behalf (after all, Peter's son Alexey, being a greedy, devious, weak and hysterical man, made a secret treaty with the Orthodox Church, and even with the Vatican, conspiring to overthrow his "godless" father and to kill him). Jack asked me if Ivan the Terrible and Peter the Great were from the same family line. Strange question. I guess he was testing my knowledge, as earlier he was testing my Russian patriotism. Unlike most Russians, I don't have any patriotic sentiments but I know the basics of Russian history, of course. I gave Jack a short lecture on Ruerichs and Romanovs, Ivan being the last in the Vladimir Monomach's viking line of Ruerichs, Boris Godunov's interregnum, Mikhail Romanov being elected for his stupidity by the boyars who needed somebody easily manipulated. Forgot to mention Dimitry the Impostor and Vassily Shuisky, but I don't think Jack was particularly interested in Russian history -- he was mostly interested in my attitude toward Russia. I also told Jack that not only Ivan and Peter killed their sons, but Peter's father, Alexey Romanov, killed his elder son by "blessing" him with the heavy, gold-cased icon for marrying without permission. Jack asked me about the current state of affairs in Russia. He was interested in knowing why I wouldn't want to return there. I explained that Russians have an opportunity now to tell and print almost anything they want, and even (to some extent) to start a small business, but that they prefer playing old games of persecution, theft, and deadly intrigues. When an old mining horse is finally given an open pasture, she continues to go in circles. Life without deadly danger seems flat, unspiced to the Russians, the idea of earning their living by honest work bores most of them. Why work if you can steal? We agreed with Jack that it would take at least several generations for Russians to forget their old ways, and to get used to be self-controlled rather than police-controlled. During this conversation about Russia I have read aloud a letter from Jack's Russian admirer (Siberian SF writer who promotes Vance on Russian Internet and helps me with publishing my Russian translations of Jack's works). I also confirmed my worst suspicions: Vances haven't been paid a penny for all those numerous third-rate Russian translations of Jack's books printed in Russia. Jack said that he doesn't give a damn about payments but Norma and John were concerned, and made me repeat my promise that I would do anything in my powers to prevent further pirating of Jack's books in Russia. Yes, I would, but translator's powers are very limited. 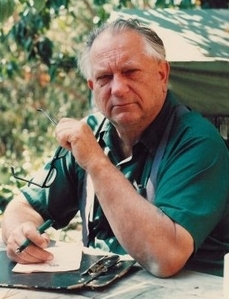 Jack Vance did assume a pose regarding payments due to him, his fame (he is undeniably famous, and he knows it), his reputation as compared with the reputations of the contemporary writers, and many other things. It is understandable in his position. At the same time, he repeated twice or thrice, firmly: "I may die tomorrow." I have never met a man with whom I would agree more on more points than Jack Vance. Our only (notable) disagreement was about tastes in music. There we had a shouting match, though I think I made my point. I'll tell about it separately. Jack Vance is physically strong for his age but has that saintly look of an old sage (partly because he has a habit of turning his face straight up with remote, unseeing eyes looking far through the ceiling when he thinks and asks questions). Jack Vance looking straight at you, with his head slightly down, is intimidating, almost fearsome -- nothing kind or saintly there! When I was leading him through the restaurant hall (they've got two stupid steps up, leading to the central bar area, followed by the two stupid steps down --architectural "innovation", I presume), I told Jack that people around were smiling after looking at him. He asked, somewhat aggressively: "Why is that?" I said: "I suppose because you have a very kind appearance". "What a joke!" - exclaimed Jack. - "And they tell me I insult everybody around!" Like his creation Treesong, Jack Vance speaks in several voices. He has a canorous, resonant voice when he emphatically disagrees with something. His voice isn't high but isn't low, either. I would describe it as a high baritone or a low tenor. When Jack Vance discusses things in which he is casually interested -- cosmology, physics, the origin of the languages and cultures, evolution of man, poetry, translation, writing, jazz, musical instruments, peculiar situations and notable characters -- his voice becomes much softer but remains expressive. The most curious voice Jack Vance has when he speculates on difficult matters, when he is not sure of his opinion but makes the best guess or a conjecture -- he grabs his forehead with one hand, hiding his face, and starts to swing from side to side, like a caged animal; in these moments his voice becomes one of the whining, wondering child talking to himself. In fact, he _is_ talking to himself, in half-sentences, allusions, connotative references of most unexpected kinds. His last, most significant voice is silence. Three or four times during our conversations, faced with the argument he didn't foresee, Jack had suddenly become serious, silent, almost frightened -- like a chess player who has encountered an unexpected opponent's move, and doesn't know yet if that move is devastatingly strong or exhilaratingly stupid. He doesn't like it when somebody else comes up with the idea or comparison or argument that he didn't apprehend. This amazed me most of all: finally, first time in my life, I've met a man who actually says nothing when he has nothing to say! I must mention that, being near Jack Vance, I had, almost all the time, a weird forefeeling. Not only I knew in advance what he was going to say but I constantly noticed that he understood what I was going to say -- not from some half-word or first intonation, no -- before the words were spoken. Neither I nor Vance believe in telepathy but if I were more mystically inclined I would describe this rapport as a beginning of ESP. I recalled an interesting exchange of questions and answers that took place in the very beginning of my first conversation with the old writer. This exchange reflects Jack Vance's (as well as mine) understanding of the difference between traditional and modern Christianity. Q: "What do you think of Christianity, in general?" Jack Vance: "Well, two or three hundred years ago, in Europe, practically everyone was a Christian. You cannot hold it against them." Q: "But is it understandable to be a Christian in our times?" Jack Vance: "It is understandable if one grows up within the confines of traditional religion, goes to church regularly with parents... It becomes a habit people don't think about." Q: "What if a grown-up, educated man converts to Christianity today?" Jack Vance: "No, that I can't approve. We've got one life, and that's it!" Later, Jack Vance made several very sarcastic comments on the origin of religion, and confirmed that he is an atheist. Jack Vance is against even the slightest attempts of linking science with religion, and called Pemrose's books on physics an "obfuscation" (Pemrose mixes complex, advanced physics with some mystical notions). For the same reason, Jack Vance disagrees with the Big Bang theory, which, in his opinion, is "too anthropomorphic" a conjecture that doesn't fit the observable facts. When I called the Big Bang theory a "creationists' creation", Jack Vance laughed and agreed. Jack Vance was very angry at the bee-hive attacks by the proponents of the Big Bang theory on Fred Hoyle. He said: "They've been beating, and beating, and beating poor Fred on his head until he finally hollered: "I give up, I give up!" But Fred was right!" I've noticed that Jack Vance becomes very emotional when he talks about cosmology. When we talked about anti-Semitic atrocities and attacks, Jack Vance made the following statement, loudly, and no less than two times: "Christianity is a root of all anti-Semitism!" This time I'd like to say a few words about Jack Vance's attitudes toward music. Since I disagree with Jack on some very important points pertaining to music, it is a somewhat unpleasant task. From the very beginning of our first conversation, Jack Vance made it clear to me that he knew in advance about my musical preferences, and didn't concur with them. In particular, he said that Beethoven's symphonies are no more than "intellectual entertainment for tawdry gentlemen in dress-suites, with monocles in their eyes". Jack mentioned, however, that he likes Beethoven's chamber music, specifically his string quartets. I could only conclude that Jack Vance never paid attention to his choice of performers when he listened to Beethoven's orchestral music. Modern recordings of Beethoven's symphonies, and even some older ones (von Karajan's, for example) can create an appalling, boring, totally warped impression of these beautiful, deep, and inspiring compositions. Later the same day, Jack Vance invited me to listen to a couple of tape recordings of early jazz pieces made by the group called "Black Eagles". Knowing that his musical tastes are very peculiar, he was aggressive about it: "It will take some time, and you may not like it. Do you want to listen? Yes or no?" After some consideration, I said "Yes". And so it began -- repetitive, screeching variations on a vigorous but simplistic harmonic sequence, reminding me of a mad merry-go-round that went off the rocker and spins about the amusement park, falling trees and breaking soda fountains. I wasn't shy about sharing my impressions. More than that, I called this music "primitive". Jack Vance was angry! "'Primitive' is a wrong word to say!" - thundered Jack. - "Those are very subtle variations, very difficult to improvise, built upon a solid base, and changing in time like an ornament changes in space". I was taken aback by Jack's emotional reaction but stood firmly on my ground, saying that "primitive" may be a wrong word but, surely, this music, in comparison with the best classical achievements, is simplistic, as even the most beautiful Oriental ornament is simplistic when compared with the Claude Lorrain's landscape. Jack Vance vehemently disagreed, saying that I don't understand jazz. I hurried to confirm that I know practically nothing about jazz, which is as alien to me as Hindu sitar music. And here I appealed to Jack's formidable intellect. I said: "Millions of Hindus are capable of sitting for hours, enjoying the subtle variations in their beloved sitar music -- variations that to our untrained ears seem more like monotonous coyotes' howling. Can you imagine that early jazz created a similar impression upon my untrained ears?" Yes, Jack could imagine that. "Well, then!" - I said, - "Do you agree that these are three completely different languages: early jazz, sitar music, and classical music?" "Yes, that is so," - nodded Jack Vance. "Why don't you write your books in Laotian?" - I asked. Jack Vance was surprised only for a shortest moment, then laughed. I started to explain that classical music has at its disposal a much larger lexicon, understandable and familiar to much larger audience. Jack Vance interrupted me, saying that I made my point, and that he fully understands what I was trying to demonstrate. He fell silent for a minute, even sad. To further corroborate my argument, I suggested to Jack Vance that he, perhaps, made his conclusions about classical music on the basis of bad performances, since in our time only a careful research allows to find a recording of classical piece, which is not played by the people who couldn't care less about what they are doing, as long as they play the right notes more or less in time. I invited him to compare, for a minute, the beginnings of two different recordings of Bach's "Mattheus Passion", made in 1980s and in 1940s. I explained that the first recording, a modern one, was made by the most professional German singers and musicians, using the best possible electronic equipment, while the second, old recording, was made in the tragic times of Second War by the German musicians who knew this music and its meaning by heart, conducted by Wilhelm Furtwaengler, and registered using a single electrical microphone. Jack Vance listened for a minute to each of the two recordings. He was visibly impressed by the second, old one, and said that there was a startling difference between the two, that he liked Bach played by Furtwaengler very much, and that I made my point again. He said that even the sound seemed to be much better in the old recording, and that it was amazing, considering the difference in the technical equipment. Our argument about music ended there. Jack Vance didn't touch upon this subject in our further conversations neither during the same day, nor on the next day. Of course, I didn't succeed in changing the 87-years-old writer's tastes in music. But I hope that I gave him something to think about. At least, he didn't seem to be angry with me any more. As a final touch, let me remind those who seem to find a lot of cultural support in Jack Vance's peculiar interest in early jazz that Jack includes any and all styles and forms of the post-WWII jazz, together with any rock and pop and rap and hip music, into that category of modern music that he reckons to be "abysmal noise". Also, he values classical music, and agrees with the notion that it speaks in a complex and most diverse symbolic language. Thus, Jack Vance's tastes in music cannot serve as a consolation to the cultural insolvents. Jack Vance said that he is writing another book, because there is a lot of unused material left after finishing "Lurulu". He refused to reveal the name of his new book, and refused to tell Bruce if the Fountain of Youth would be found in "Lurulu" or in his new book. He just smiled and shook his head. He didn't want to talk much about his books, saying that he doesn't remember details. But he gave an answer to my question about names like "Dasce" and "Alusz", saying that those "sc" and "sz" letter combinations are "just decorative". He pronounces "Alusz" as "ah-LOOSS". Jack Vance thinks that a good translation of poetry into another language is impossible, and I agreed with him. "How, then, are you going to translate those pieces of poetry in my books, Navarth's verses, for example?" - he asked. I said that I would write new pieces of poetry creating similar effects, and that I am not a stranger to poetry, having published two books of Russian versifications. Jack said that I gave a satisfactory answer. The Sultan's Turret with a Shaft of Light!" As impotently moves as you and I." That stuff was written a thousand years ago, and it's as fresh as yesterday's! That's poetry! Jack asked, why I picked one of the most depressing stanzas as my favorite? I dived into the deep matter of the difference between Russian-Jewish and Anglo-Saxon temperaments. At that point, Jack asked about the origins of my last name, and was amused by my account of INS's adding an "h" to it as a compromise between the true "Fet" and their mistaken "Felt" (they couldn't remove a letter from their papers when I entered the US but agreed to change "L" to "H" as a compromise). I said that I don't mind the "feht" spelling, because I like to burn the bridges behind me. Jack Vance surprised me in many ways. He recites from "Faust" in German. Unlike most Americans, he knows very well the difference between "kazakhs" and "cossacks", and even drunk kumys! He speaks freely about the details of sadistic Mayan-Aztec culture (he disapproves of it vehemently). He condemned progressive taxation. He thinks that any society, inevitably, is stratified into castes, openly or latently, and that the most we can hope for is some measure of vertical mobility that allows talented people to get closer to the top. Jack Vance thinks that modern American society is one of the most benign in history but that political correctness and other socialist "experiments on people" are iniquitous and should be stopped. Jack Vance disapproves of both liberals and conservatives, saying that "a thinking man cannot take sides, or, if he does, he does it only temporarily, for the moment, depending on the subject." When I complained about the obvious persecution of talent and achievement in the modern world, Jack Vance called upon me to be more optimistic and open. "Thinking men are out there," - he said, - "you just need to find them, they usually keep low profile." Jack Vance said also that success is a matter of luck, not of talent, and that it has always been so. Jack Vance doesn't collect anything himself but is extremely interested in the process of collecting and in collectors' psyche. He agreed with my notion that the main attraction of collecting is using the advantage of knowledge in order to spend a dime on something worth a hundred dollars. Again, he pleasantly surprised me by approving such a "mercantile" interest. Jack Vance asked me if I am happy with my life, generally. I said: "No! I am greedy, I always want more! I want to see every country, to speak every language, to conquer the world with my music, and to fix every injustice!" Jack smiled, and said: "Me too! I've never been satisfied with what I have done." Jack is skeptical about space exploration, reckoning that it is too expensive and risky to be viable, but he agreed with me when I said that if there will be a profit to be made in space, then human conquest of space will really begin. "That is a good point," -- he said. -- "Money will do it!" We didn't make any photographs and didn't ask for autographs. Jack noticed it, and was pleased: he is visibly tired of "tourist visitors." I've had a definite impression that Jack Vance mostly hides his real self from the people who surround him. I am not saying this to grind some ax or to lash out at somebody in particular. It is an inevitable, tragic fate of a genius. The man who writes Jack Vance's books is deep down there, refusing to read any contemporary literature, reacting to all modern music (including post-WWII jazz) as to "abysmal noise played by the automatons", and laughing at abstractionist paintings. "Any art -- literature, music, painting -- is simply a language of symbols," -- says Jack Vance. -- "If an artist uses understandable symbols and has enough talent, he conveys his emotions and his view of the world to the others. If an artist invents anew his own language that nobody understands or that is difficult to learn, then, no matter how talented he is, he is not understood or he is misunderstood. A piece of art becomes a Rorschach test, in which anybody can see anything they want. This is not art." Jack concluded: "Excuse me for using a bad word once, but everything that these art historians and musicologists write about art is BS! Art is a language, and that's it!"